As we’re settling into the new school year routine, opening our books and our minds, we look at what we have learned and still can learn from Gumby. Gumby creator Art Clokey was a huge proponent of learning. Early in his career, he spent a few years as an art teacher in Santa Barbara, California. Art loved to read and wanted his Gumby episodes to encourage children to seek out information. He wished to spark their young imaginations and spur them to read into new adventures… just as Gumby and Pokey can walk into any book and find themselves in an historic or futuristic time and place. Gumby’s fun adventures give us a glimpse into history or introduce us to other cultures and people. Gumby has helped George Washington, he whirled with the Dervishes, tamed dinosaurs and chanted with Kachinas. What a creative introduction to significant people, places and events of the past! This image from the 1980’s Gumby episode, “Blocks in the Head,” reminds us of the significance of the name of the two mischievous trouble makers in Gumby’s world… the Blockheads. Art shaped their heads into blocks to represent square thinking! Gumby models being flexible, creative, using imagination and diving into books as the alternative to being a Blockhead. Last spring the Gumby Central gang had the privilege of attending an amazing musical performance inspired by Art Clokey’s works. Secondary school band director Ralph Martin, at the Vacaville Christian Schools in California, obtained permission from the Clokey family to use the musical scores from “Gumby on the Moon” and “Gumbasia” in his lessons and for a non-profit concert. 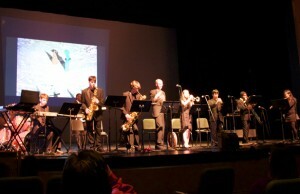 The sixth through twelfth grade students in the school’s jazz ensemble, Radio Jazz, practiced for months. They transposed and performed the actual music from “Gumbasia” at their concert in March 2012. View the “Gumbasia” performance. After listening to the original music to “Gumby on the Moon” and watching the episode on video over and over, the students composed their own original music with several movements to correspond with the passages in the video. The episode was shown on the large screen behind the band as they soulfully blended the hip and mysterious melodies they had written to evoke Gumby’s extraterrestrial experience. See the “Gumby on the Moon” performance. What talent and creativity! The professional performance quality earned the band gigs as an opening act at the world-famous Yoshi’s jazz club in San Francisco. Congratulations! We applaud Ralph Martin for his dedication and unique approach to teaching. We know the talented students in Radio Jazz will go far. In Florida a number of school districts are participating in a program called Stretch for Excellence, a campaign to motivate students and staff to stretch beyond the normal, expected outcomes and to never give up. It is designed to foster that “can do” life attitude that helps a person excel in our information age. The program started first with teachers and support staff in a public school in Florida. They received much needed recognition through the 3” and 6” bendable Gumby, a token or reflection how “flexible” they had been. 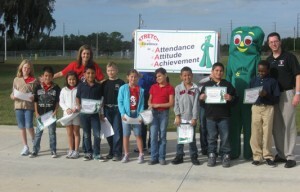 Each month honorees were awarded the coveted “Gumby Award.” The program was so successful that it expanded to include students and has been used each year since its initiation in 2009. Gumby green can be found in almost every office and in many classrooms. More and more enthusiastic students challenge themselves as the concept continues to spread to new districts. Keep on stretching for excellence! As Gumby has shown, learning can be fun.